BMSB is a pest native to Asia and was first observed in Oregon in 2004. It is a nuisance pest in urban areas and an agricultural pest in vegetables, fruit crops, and hazelnuts. In the eastern USA, where BMSB has been established since the early 2000s, damage to fruit crops is severe. Current management programs are heavily reliant on insecticides. However, chemical control is not always effective due to BMSB’s movement patterns between crops and ornamental hosts. 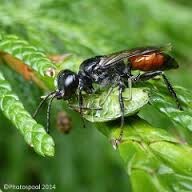 Managing BMSB may improve due to the arrival of samurai wasp (Trissolcus japonicus), a small parasitoid wasp native to the same region as BMSB. This wasp attacks BMSB eggs, lays its own eggs inside, and completes its development inside the stinkbug eggs. 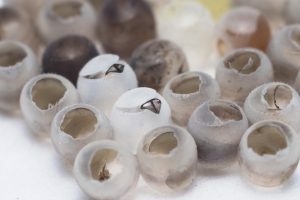 BMSB eggs that have been parasitized by the wasp are best recognized by an unusually dark color or by the irregularly shaped emergence holes. The two lighter colored egg masses with black triangles are unparasitized egg masses, from which BMSB nymphs have emerged. Currently, we are studying samurai wasp behavior and the potential for samurai wasp establishment in hazelnut and small fruit orchards. Stay tuned in Spring 2017 for a guide to identifying evidence of samurai wasp. This predatory wasp species attacks stink bug nymphs. After locating a nymph, female wasps incapacitate a nymphs with their stinger, carry a nymph to their nests, and lay their own eggs atop the nymphs. As the wasps’ larvae hatch, they feed on the incapacitated nymph. These wasps are established in the Portland metropolitan area. 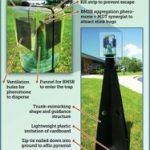 Several trapping techniques that capture BMSB and detect population patterns. Pyramid traps baited with an aggregation pheromone can detect BMSB, even at low densities. 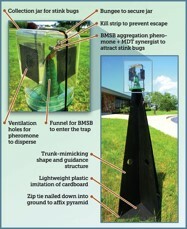 However, these traps are most effective later in the summer and early fall. Reliable trap and bait combination is needed for early season BMSB to protect developing fruit and vegetables. We are working to develop the optimum bait/trap design combination, which will allow growers to detect the pest as soon as it enters the field, so that they can take immediate action to protect their crop. A guide towards identifying and managing BMSB in orchard crops. Reports from citizens and growers are imperative to identify the continued spread of this invasive insect and to evaluate the risk of damage to different crops. Help monitor the distribution of Brown Marmorated Stink Bug in Oregon by reporting any sightings of the pest. How to identify samurai wasp? Print and mobile-friendly guide available in English and Spanish. The samurai wasp is being evaluated for control of BMSB. Visit this link for information about how to detect and report findings of parasitized BMSB egg masses. The Oregon Department of Agriculture has produced a user-friendly guide of stink bugs in Oregon.